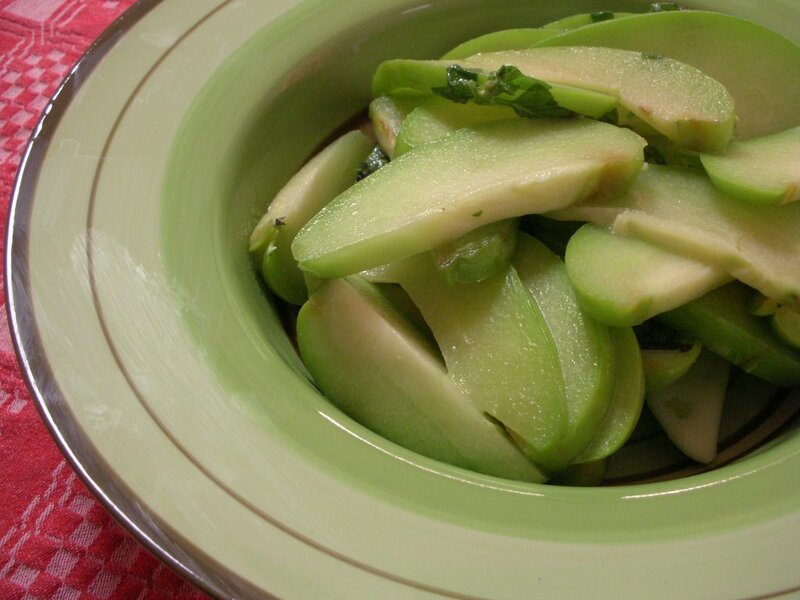 A simple, simple way to cook chayote squash, light and easy. Move over zucchini. Move over yellow squash. Helloooooooooo, chayote! It's a summer squash, native to Latin America. It's pronounced chee OH tay and also goes by the names mirliton (Creole?) and christophene (French) and chokos (Australian, you know, that whole other language). There's a soft seed inside -- a snack for the cook! Good raw, perfect for crudites. Delicate tasting, like a zucchini with punch and no sponginess. Cheap, about $1.25 a pound. And it seems to cook without losing structure so there's no mushiness like happens with overcooked zucchini or summer squash. I can definitely imagine using one or two to add volume and volume to a soup or stew. OH: did I say, I liked these? I really liked these! Most of the recipes online suggest/complain that chayotes are bland and thus need "aggressive seasoning". With just salt, I found them delicious, just as is, simple, spare and entirely refreshing. Heat a large (especially if slicing, these are a little bulk and don't cook down) skillet on MEDIUM HIGH and add the olive oil. When the oil is hot, add the chayote and stir to lightly coat with the oil. Cook through, stirring occasionally. Add the milk (or other liquid) and let simmer for about 5 minutes. Add the chives or basil if using, let cook another minute. Remove chayote from milk. Enjoy! Kalyn - AH -- NET CARBS!!!! That's what they mean!! The good news is that since I DO pay attention to fiber, there's now a whole lot more VV recipes that qualify as low- and lower-carb. The BAD news is that I need to go back through all those ^%$ posts again to finish that new section for the Recipe Box. OH WELL -- it'll get done. Heres the way a south indian would cook it. 3. 2-3 green chillies slit lengthwise. 4. 1 tbsp grated fresh coconut. 5. 2 cups diced chayote squash. ->Heat oil in a wok or skillet. On medium heat, add the mustard seeds, split black gram dhal, curry leaves and saute it for 30 seconds or so under the mustard seeds splutter and the dhal gets a little brown. ->Add the split green chillies and saute for about 30 seconds more. Add the diced squash and saute it for 30 seconds so that the oil coats the squash. Sprinkle a little bit of salt, mix it and cover the skillet and let it cook. ->It usually takes less than 10 minutes for it to cook thoroughly. ->Sprinkle fresh coconut on it. We usually have it with rice or vegetable that goes with rotis. A light and nutritious meal. We also make chutneys with this squash. I've been a frequent visitor to your website for the past month or so and love how you post the weight watchers points for the recipes. PAMELA says: I have used chayote squash in the past as a saute with bell peppers of all colors, sweet onions, mushrooms and fava beans. I just seasoned all in a little oil and sauted until just done. I used whatever herbs I liked. One of my favorites is Summer Savory! Tonight I am using sliced chayote in a similar saute, but I will be including smoked beef sausage and mixing with whole wheat pasta as well. Mmmmm so good! With or without the sausage. Enjoy!! OMG! I can'r believe you say to "slice out" the seed! The seed is entirely edible (not to mention tasty) - story in my family goes: my Mexican uncle used to eat JUST the seeds, and feed the rest to the hogs. (Must have had a lot of waste - there is only one seed per squash). Try it! (I don't throw the squash to pigs, I mean try leaving the seed in when you cook it). Hi Watch City -- I'm laughing because we are 100% in synch. You'll see that it says to slice out the seed -- and that it's a great snack for the cook! right there and then! BTW I don't remember for sure (there've been several hundred recipes cooked since this!) but I'm quite sure my recipe said to remove the seed -- or I wouldn't have. Next time, I'll definitely leave it in. Thanks so much for sharing the funny story about your uncle! I started seeing this small pear shaped veggie and all it told me was the name. So I bought one and asked my Mexican Granddaughter how to fix it. She didnt know how. So I just sliced it and cut it into small bite sized morsels and added it to my lettuce salad and potato salad. Wow, did it ever go over big. It has a different taste and tends to the sweet side and not too sweet. It was just delicious and so I have not cooked it as we like it raw in the salads. The recipes are very unique and one of these days, might just try cooking it accordingly. That's great, Gerry. 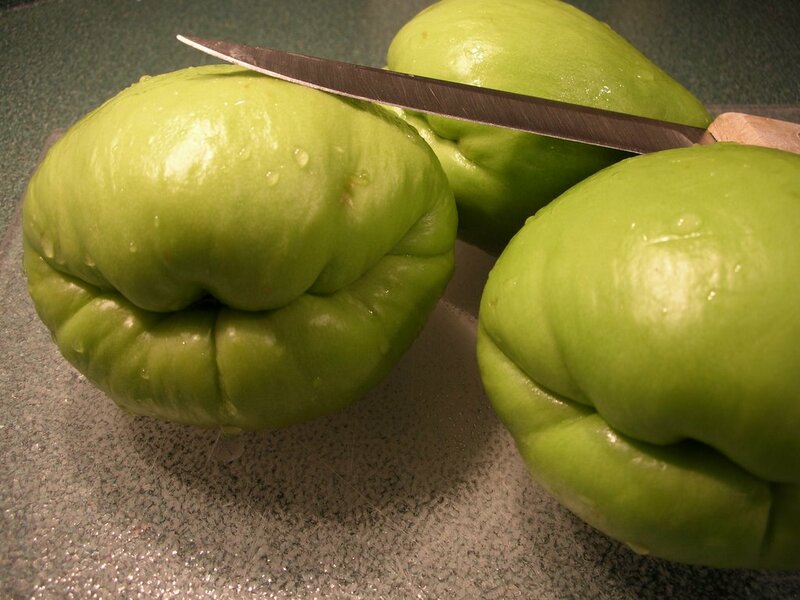 I usually 'snack' on chayote while chopping it to cook. Thanks so much for the salad idea. It's fun to experiment, yes?! Another Viêtnamese favorite version...peel and cut squash into strips (about 6 squash), add some oil to wok, cook squash until soft, add salt or soy sauce to taste, add cut scallions, stir, and then add beaten up eggs (about 6 eggs). Sprinkle in some black pepper. Serve with steamed rice. In 30 minutes, you have a dilicious dish! I bought one yesterday and thanks for all the tips, especially about the seed. It resembles a pear. I have recently acquired a 24 inch green squash from a friend who grew it in her garden. She said it was a Vietnamese Squash - I am uncertain as to how to fix it and am open for suggestions. Any ideas? Thank you! That's some squash! I've not come across one before but there are so many different varieties. I would cut into one end to see what the flesh is like, then decide how to proceed. I suspect, sorry, that it might be a lot like zucchini. :-) Taste it to see if you like it raw, if not, roasting is a great way to draw out flavor. The one recipe where I "know" that baseball-size squash can be uses is Homemade Zucchini Relish which people really really love. Thanks for your very quick response! I searched the web to find something like this squash to no avail. However, being the very resourceful person that I am, I did take your advice and cut into it. To me, it resembles a cucumber, except the insides, seeds and all are rather spongy in texture. I decided to cube it, seeds and all, added a stick of butter, chopped whole onion, salt and pepper and cooked it until tender (skin was still a little tough). I then added three eggs beaten, and poured over 1 bag of crushed crackers (I used Ritz), topped with another bag of crushed crackers, 1 cup grated cheddar cheese, 1/2 cup of parmesan, 1/4 cup melted butter ( agree with Julia Child, one can never have too much butter! )and a mixture of garlic powder, black pepper and a pinch of cayenne pepper. Baked until browned and wow! For a mystery squash, it is delicious! I love your website - just found it today and I am afraid my husband will be eating a lot more veggies! Wow, what a casserole! Sounds delish. You're welcome to blame an onslaught of veggies on me. Your poor husband won't know what hit him! Just tried it tonight and I LOVE it!!! THANKS!! Caramelize onions, then add green peppers, garlic, cook a bit then add tomatoes last. Season with salt, pepper, and a boubillon. Add cubbed quisquil and simmer @8 m. Add a bit of soy sauce at the end. Sometimes she would add a co uple of beaten eggs and served them for breakfast with refried black beans and sour cream. I mix a drained can of chick peas to a few tablespoons of tomato sauce and a few tablespoons of homemade sofrito (green peppers, cilantro, onion, habanero peppers) and add diced chayote and diced potatoes... Eat with white rice and meat of your choice.... Delicious! Oh WoW! I always Mix these with apples to cut carbs! My fav is to make a cobbler with 1/3 apples, 1/3 chayote and 1/3 fresh cranberries and puta little oatmeal and butter in it and a little milk and bake. It makes THE best low carb cobbler! Cranberries are low carb and chayote has half the carbs of apples!